Four days clean of Amazon Prime. Yes, I succumbed, but hear me out. My intention was never to stop using it entirely. It was to start making better choices about my spending in general. And sometimes, well, Prime is the only way. I have been awfully sleep-deprived. Here, in the darkest hours of winter, when I’m biologically craving more rest, I am getting less than I have in ages. Which has led me to try to set up a sleeping nook in our downstairs music room so I can slip away now and then for some emergency zzzzzzzzs. Which then led me to realizing we need another white-noise machine. Which led me to noticing that the white-noise machine in my co-working space is ideal. Which led me to the conviction that I must have that very white-noise machine, and no other will do. Thus, Amazon. The sleep thing is a constant thing. All parents are sleep deprived, I suppose. Some are better at it than others. My husband, for instance, is awesome at it. He can endure long stretches of undersleep and then, like a sleep camel, catch up suddenly and intensely under conditions I could not endure. He hoards that sleep in his imaginary sleep hump so that it sustains him for far longer than your average mortal. My friend Rebecca recently told me that she has recently realized that she deeply needs 7 hours of sleep. I knew by the way she said it that she felt greedy asking for that much. I’m a 9-er, and I never get it. My sleep metaphor is delicate flower. Conditions have to be right. I get woken up easily, have trouble falling back to sleep, and can really only sleep at all if it’s night, and dark, and I’m in bed, and there’s white noise, and the temperature is right, and the duck down ample. So in other words, pretty much never any more. I have been trying to get by on 6, or 7. But often, it’s more like 3,4,5. Whenever I’m presented with a situation that seems unsolvable and feels draining and degrading, my instinct is to ignore most advice and try to claw my way out of it, somehow, on my own. Usually, I do this by making things much more complicated than they really need to be. Thus, the sleep bunker. We have a room in our house we call “the music room” because it’s where the record player and musical instruments live. It’s also our de facto guestroom and the only logical place for my sleep bunker. The white noise machine was the first step. Now, for candles (I have a major thing for P.F. 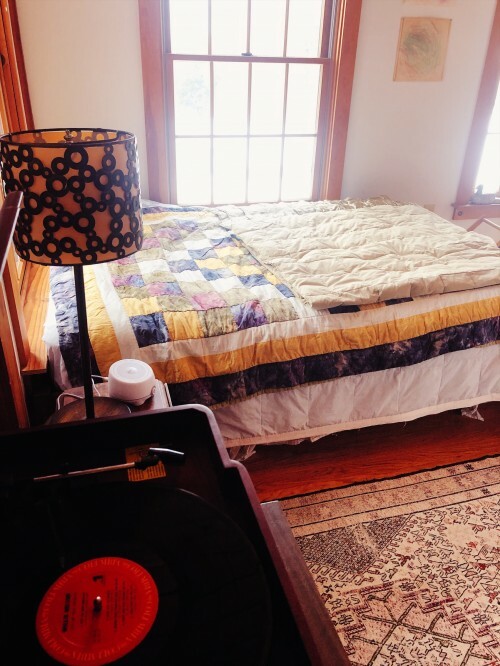 Candle Co.), the extra down and the meditation on vinyl — is that a thing? I had a full-on sugary desert this week for the first time in 8 weeks. I was out to dinner with a friend; we shared the rose-flavored creme brûlée. It tasted like pure ambrosia (whatever that is). I do not regret it. All Avett Brothers, all the time right now. Writing about virtual reality, artificial intelligence, and online event ticketing… just another day in the life of a technology-based freelance writer living nearly off the grid in rural southern Vermont!